The Film Society of Lincoln Center is hosting an all day marathon called "Bad Dads" starting at 2:00 pm. 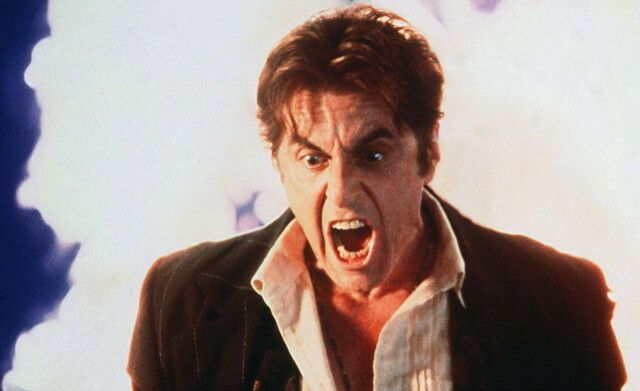 Showing are Honey I Shrunk the Kids, The Royal Tenenbaums, The Stepfather (the 1987 original version), and The Devil's Advocate, which features Al Pacino's most subtle and controlled performance of his entire career. If those don't grab you, the American Museum of the Moving Image in Queens is hosting three showings on Sunday, called "Horror Father's Day," starting at 2:00 pm with Charles Laughton's Night of the Hunter, moving on to Georges Franju's Eyes without a Face, and finally closing with Stanley Kubrick's The Shining. A perfect family film Sunday in New York. For the Manson family. What a spoiler for The Devil's Advocate! I think the statute of limitations on spoilers is 10 years. No "BIGGER THAN LIFE" ? ?